Azerbaijan, Baku, 19 August / Trend corr. I.Alizade / The Azerbaijani religious figures assessed the blast at the Abu Bakir Mosque in Narimanov District of Baku, as serious threat for the country's national and moral security. "We condemn the bloody incident and assess it as a crime against beautiful essence of Islam," said the statement by 41 Azerbaijani religious figures signed on 19 August. 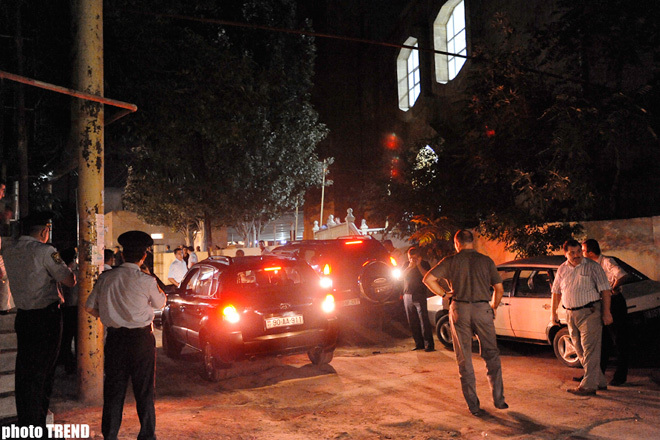 At 09.00 p.m. of 17 August, blast took place in the Abu Bakir Mosque during the evening prayers. Unknown man broke the window of the mosque and threw in two RGD-1 kinds of grenades. Baku City Public Prosecutor's Office was assigned to investigate this incident and criminal case was filed on this incident on Articles 120.2.4 (deliberate homicide through general dangerous method), 120.2.7 (deliberate homicide of two or more people) and 228 (illegal purchase, transfer, sale, storage, conveyance or carrying of firearms, components parts of them, ammunition, explosive substances and facilities) of the Criminal Code. "We state that none of reasons and emotions can justify attack to the worship house and homicide of people who pray there. This incident is unambiguous threat for the Azerbaijani national and moral security regardless of who is an organizer or committer of this incident," the statement said. According to religious figures, the Azerbaijani society should demonstrate united principal position on this matter and issue obvious and unambiguous messages about irrelevance of such methods: "We believe that various layers of society should demonstrate accurate position that these actions will not undermine stability in Azerbaijan." They noted that organizers or committers of the terrorism should think of the Azerbaijani people on the background of this tragedy. In this case, people, who want to turn Azerbaijan into their extremist game arena, will give their intentions once and for all. "We urge all Azerbaijani people, especially, devout people to condemn this tragedy and to demonstrate patience and self-control," the statement said.